UP Manila and UP Visayas Campuses Released Academic Calendars for 2014-2015 - Balita Boss! 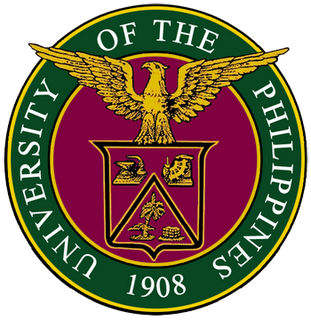 The University of the Philippines, the premier academic institution in the country, will move the start of classes from June to August for academy year 2014-2015. Along with five other UP campuses, UP Manila and UP Visayas will shift its academic calendar on a pilot basis. University of the Philippines officials said this will make the university synchronize with ASEAN, European and American academic partners. The Manila and Viasayas campuses released the new schedule. According to the official Facebook Page of University of the Philippines – Manila, first semester will begin on August 6 and will end on December 5, 2014. The second semester will start on January 26, 2015 and will end on May 29 while the summer class will run from June 17 up to July 17 2015. That’s the same schedule applying to the School of Health Sciences in Palo, Baler and Koronadal. 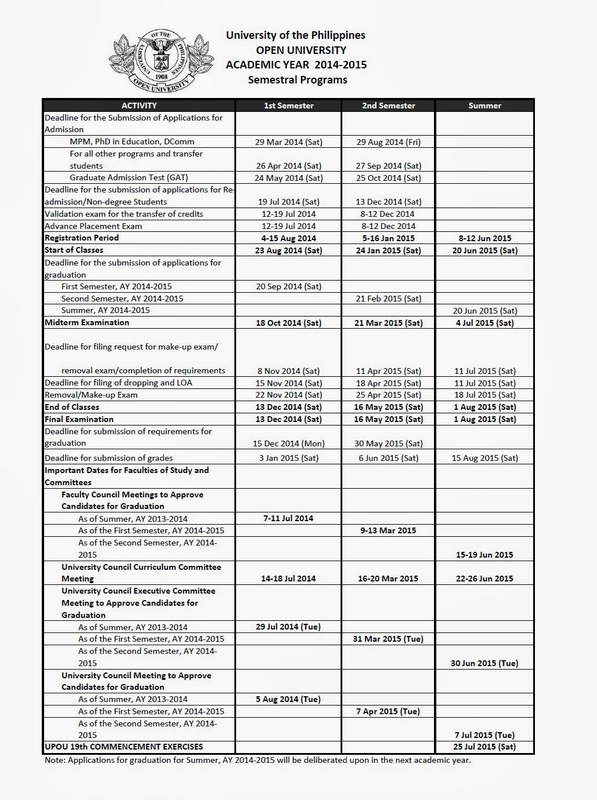 For the University of the Philippines – Visayas campuses of Miagao and Iloilo City, the first semester for Academic Year 2014-2015 will jump on August 18 and ends on December 5, 2014. The second semester will start on January 26 and finishes on May 22, 2015. The summer class will begin on June 18 until July 24, 2015. 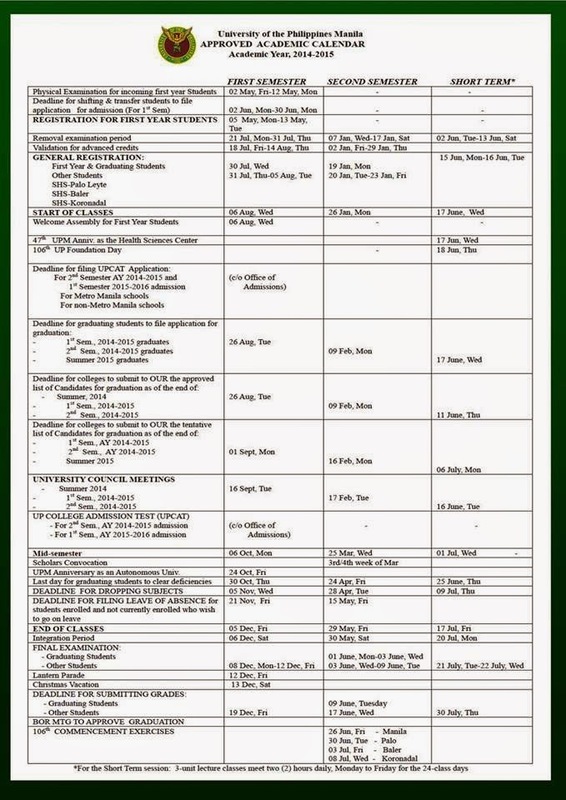 The University of the Philippines Open University (UPOU) has also released its new schedule for year 2014-2015. Under the new academic calendar of UPOU, the first semester of all semestral programs will start on August 23 to Demember 13, 2014, and the second semester will run from January 24 to May 16, 2015. For UP Open University trimestral, the program will be from September 6 to November 29, 2014, January 3 to March 28, and May 2 to July 25, 2015. UP Baguio, UP Los Baños, UP Mindanao and UP College in Cebu campuses will adapt also the shift of the opening of classes, but have not yet released their complete academic calendars. UP Diliman will not shift its academic calendar because consultations with stakeholders are not yet complete, according to UP announcements.